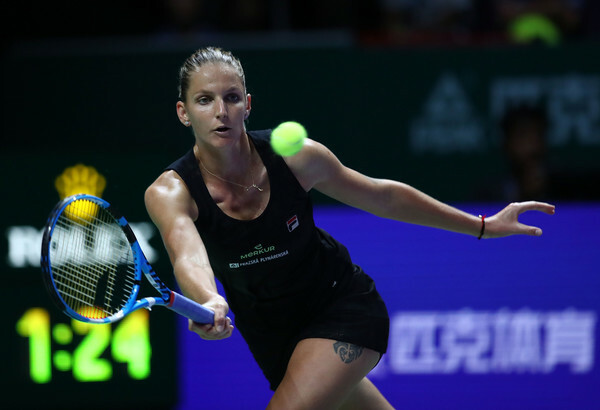 It was a world-class performance from Karolina Pliskova as she shocked defending champion Caroline Wozniacki on the first day of the 2018 BNP Paribas WTA Finals Singapore presented by SC Global. 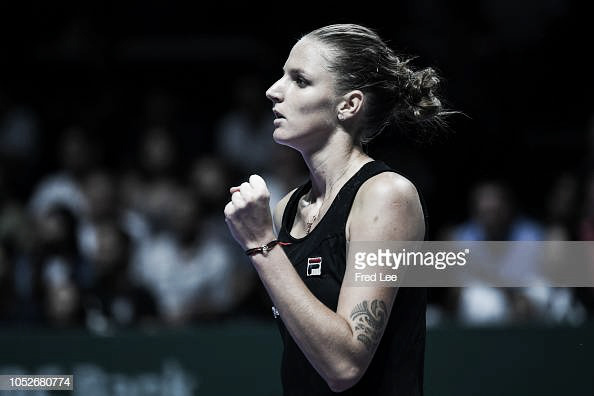 It was a day of upsets on the first day at the 2018 BNP Paribas WTA Finals Singapore presented by SC Global, and this time it was seventh seed Karolina Pliskova who steered her way to an unexpected and comfortable win over defending champion Caroline Wozniacki with a relatively straightforward 6-2, 6-4 scoreline although things did not seem that straightforward out on the court. This was a repeat of last year’s semifinal encounter, and Pliskova managed to exact revenge for that heartbreaking loss with today’s straight-sets win. The Czech came into the match as the underdog but was serving exceptionally well while she managed to outlast Wozniacki at the baseline amidst a worrying sight of a right calf being heavily taped up. She saved all 10 break points she had faced throughout the encounter while Wozniacki only had no one to blame for missing all these opportunities as Pliskova was simply playing on another level. Both players contributed to this high-quality affair and ended up with positive winner to unforced error ratio, with Wozniacki firing 20 winners to just 17 unforced errors while Pliskova found 22 winners to 21 unforced errors. 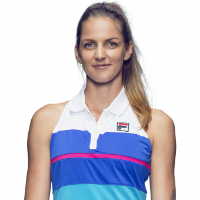 Pliskova will now face fellow Day 1 winner Elina Svitolina, while Wozniacki will battle it out against familiar foe Petra Kvitova on Tuesday. It was a confident start from Wozniacki after the Dane served an ace to begin the match with. Playing with assertion and finding her rhythm early on, the defending champion quickly held her serve within a blink of an eye before grabbing two break point opportunities. However, with some invincible serving from Pliskova, the Czech fended off those break points with unreturnable serves before sealing the nervy opening service hold. Wozniacki started to hand out several free points as she sprayed errors out from nowhere. The usually-consistent Dane was soon broken despite having the brighter start and went on to lose a 0-30 lead on the return which allowed Pliskova to consolidate the break for a commanding 3-1 lead. Everything seemed to be going wrong for Wozniacki, who is becoming increasingly erratic, while Pliskova was incredibly solid. 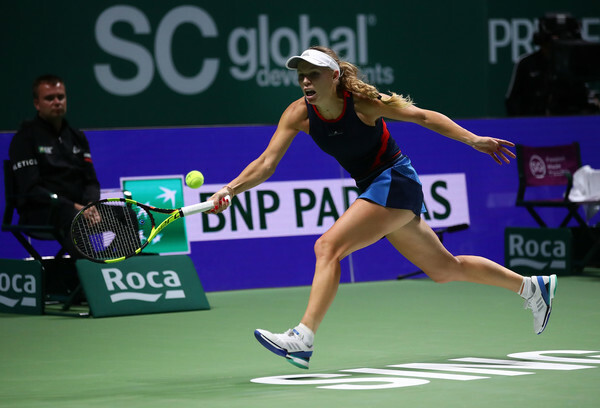 Despite an on-court coaching session by father Piotr Wozniacki, the world number two was unable to convert her chances which ultimately proved costly. She earned two break points once more, but this time it was the same old story as Pliskova showed some nerves of steel and narrowly held for a 5-1 lead. Looking to stop the rout, Wozniacki put in a perfect service game, closing it out with a terrific backhand down-the-line winner. However, it was too late to produce the improbable comeback as Pliskova calmly served out the opening set after just 36 minutes of play. The slew of unforced errors just kept coming in from Wozniacki, even in the second set. Her forehands were being a huge liability and as a result, Pliskova pounced all over those vulnerable shots and broke to start the second set. Once again, Wozniacki had the golden opportunity to break straight back but was wasteful on her chances. In what was the longest game of the match, Pliskova managed to consolidate the break within the tightest margins, closing it out with a stunning forehand down-the-line winner. 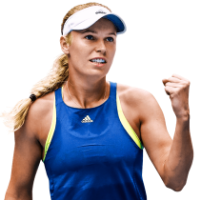 Wozniacki started to get fired up, and the momentum seemed to have shifted when the Dane saved a break point and held serve in an all-or-nothing game at 1-3 down. 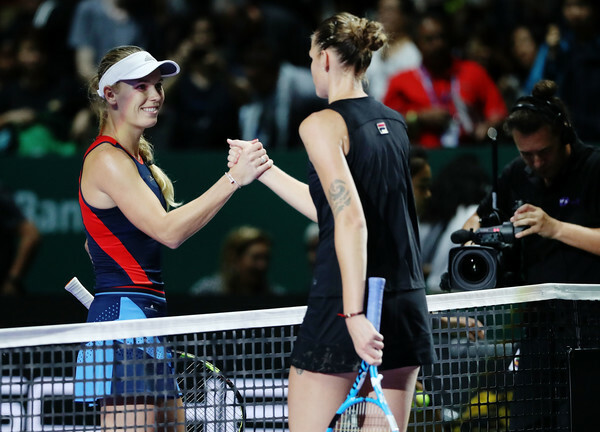 She became more aggressive and charged towards the net on more occasions, keeping Pliskova at bay as Wozniacki looked to have gained confidence in her game. Pliskova was looking to keep her lead although she was threatened on a couple of occasions during the match. Wozniacki kept digging for chances — and she successfully earned them — but was just unable to convert. The Dane was extremely tight on break points and Pliskova was completely calm and nerveless — a crucial factor which could have turned the tables on either player today. The world number two and defending champion was in serious trouble after having to save two match points while serving to stay in the match, although she quickly gained the momentum and steered her way out of the trouble. Within a blink of an eye, Wozniacki found herself having two break points to return level while Pliskova was serving for the win. The Czech seemed to have felt the pressure for the first time in the evening but stepped up her game when it mattered as consecutive winners from Pliskova brought her back to deuce. Serving an ace on her third match point, Pliskova finally grabbed the win after an hour and 32 minutes of play.